You've been asking me for SO long to share a recipe for a cream and I've been tweaking and tinkering and am finally happy with the results. I was inspired by a recipe from herbalist Rosalee de la Forêt but adjusted it to make it simpler and feel better on the skin. I've tried to give lots of options throughout the recipe so you can choose what best suits your skin. I've also carefully chosen all-natural ingredients that you can find at a health food store to keep it simple. This cream blends moisturizing jojoba and shea butter with deeply hydrating floral water. I love it as a facial cream to use at night so I wake up with glowing skin but it's also fantastic for any dry areas on the body for some extra TLC. Wherever you use it, your skin will be happy! While you are more than welcome to skip this step, I highly recommend infusing your oil with dried herbs. It's a wonderful way to add more benefit to your cream. 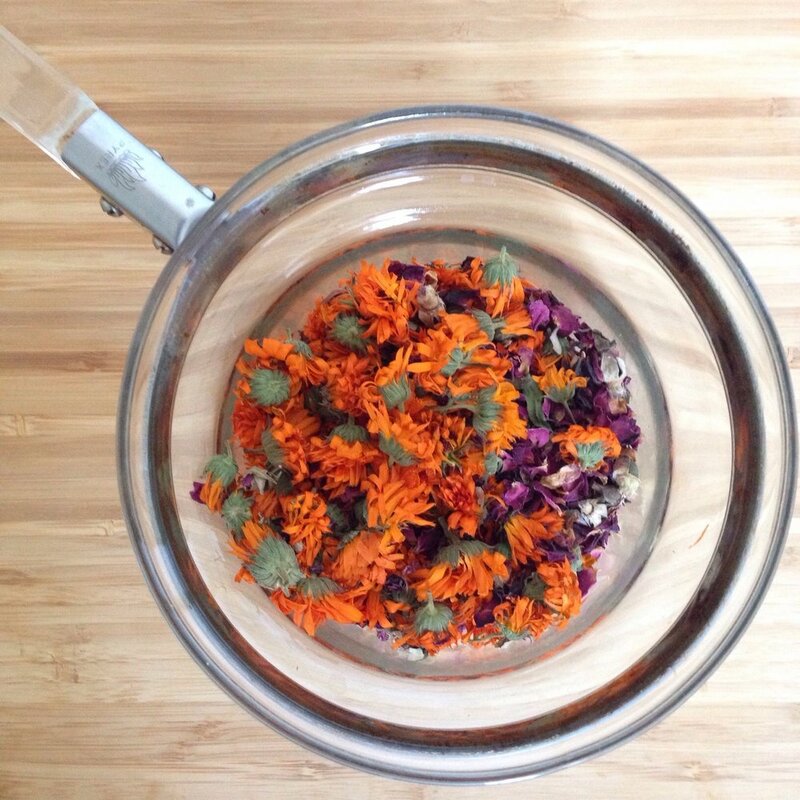 There are a number of herbs that are nourishing for the skin but one that I always add is calendula. This lovely orange bloom is soothing, reduces irritation and redness, and helps to promote skin regeneration which will minimize scarring and wrinkles. It's also naturally antimicrobial which can help to keep skin balanced and prevent infections. Calendula is safe for all skin types and helps to relieve eczema and other forms of dermatitis. Chamomile is another herb that's gentle and soothing for the skin and is a mild astringent to help minimize pores. Rose petals help to add an anti-inflammatory benefit and are soothing for the skin. Green tea, sage and dandelion leaf are all rich in antioxidants. Finally, lavender is cooling and promotes regeneration while also adding an antimicrobial benefit that can be nice for acne-prone skin. Floral water or hydrosols are made by distilling botanicals to draw out their therapeutic benefit into a water-based medium. They have similar properties to essential oils but are less concentrated making them ideal for sensitive skin. The addition of a water component also adds hydration for the skin. Our skin needs both water and oil to be balanced and moisturized. There are a variety of floral waters, most health food stores will carry rose water, but it's also possible to find lavender, neroli (sweet orange blossom), calendula, chamomile, cucumber, geranium, sage and ylang ylang. The floral water will contain the properties of the plant you choose as well as its scent. Please note, often grocers will sell rose water, but this is water with the addition of rose fragrance for use in cooking. This is not the real stuff! We want the therapeutic benefit of the plant not just perfumed water. Making creams and lotions at home can be a little trickier than making a salve or balm because there is a water component. Since oils and water don't mix, we need to add an emulsifier. There's lots of options but many have to be ordered online and often contain synthetic additives or highly processed ingredients. In this recipe, I've gone for all-natural and accessible, so we're using beeswax. I love beeswax! It's a breathable, nourishing and naturally antimicrobial emulsifier that is fantastic for all skin types. If possible, find organic and meet a local beekeeper - they tend to be wonderful people! If buying from a health food store, purchase cosmetic (not candle-making) grade. If you're infusing your oil with dried herbs, add roughly 1/2 cup of loosely packed herbs to a double boiler and cover with 1 cup of jojoba oil. Infuse herbs in the double boiler over a low heat for 3-4 hours. You can also use a slow cooker on the lowest setting. Once infused, allow to cool and then strain out herbs using a nut milk bag, several layers of cheesecloth or a bit of old pantyhose. Squeeze to release as much oil as possible then top up to 1 cup. Meanwhile, mix your hydrosol and rosemary extract together, if using. You can also add essential oils at this point, roughly 30-40 drops total. Please note, if you haven't tried the essential oils on your face I'd recommend a spot test before adding to your cream. Simply mix 1-2 drops of the essential oil in a little carrier oil (like olive or jojoba) and apply to the face. Wait for 24 hours to ensure there's no reaction. Allow to cool completely, then transfer into containers for storage. (Cooling the cream will prevent condensation from forming inside your container.) I used dark glass to protect from UV light, but you can also use a silicone tube or a pump dispenser if you prefer. Store in the fridge until your ready to use it to extend the shelf-life. Creams with rosemary antioxidant will keep for 3 months in the fridge and for roughly 4 weeks once you being to use it. Without rosemary antioxidant, they'll spoil faster. Extend shelf-life by storing in the fridge when not in use. Hope you enjoy this lovely little cream! Let me know if you have any questions in the comments below.